Amidst his busy schedule, we managed to catch hold of Isaac for a quick interview. Isaac’s piece ‘Go Home‘ is one of the plays selected for a dramatised reading on 3 June 2017! Today, Isaac Lim tells us more about his experiences, takeaways and thoughts on writing since he participated in Writing From the Heart in 2015. I am still finding my voice, I believe. I started writing out of curiosity, and from a rich interest in theatre. I first joined the Singapore Young Dramatist Awards over a decade back and my first piece of writing won second prize. That piqued my interest in playwriting. 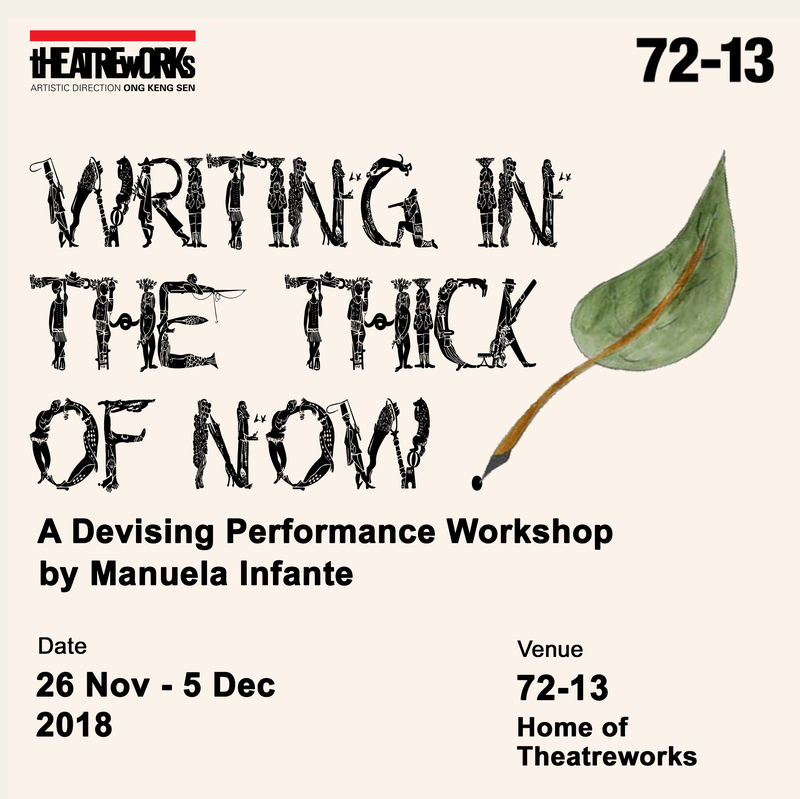 Over the years, I’ve been constantly honing my craft, from being part of TheatreWorks’ Writers’ Lab and getting mentorship by Tan Tarn How and Robin Loon, to later learning from Faith Ng in a writing module in University. I have tried a whole range of genres, I think. “Between Consciousness”, written during the 24-hr Playwriting Competition in 2015, was my first work to go from page to professional stage. Currently I’m also developing another piece of writing with Centre 42 under its Boiler Room programme. “Go Home” was first written for a course in university. After the workshop with Tony, I decided to rework the play, taking quite a bit of what I learned during the workshop and putting them into use. “Go Home” is a play about a pair of estranged father and son, who comes back to a familiar place after the death of the mother. They negotiate with each other over a whole range of matters, before learning to open up and attempting to heal wounds. ‘Home is where the heart is’, but what if the house no longer holds the good memories? This is a naturalist play, something I haven’t written before. However, with that said, I was able to connect with it in a much more personal manner. In the writing process, I have shed quite a bit of tears. It is something personal, though I do still keep a certain distance from the characters. I hope father-son relationships can also be noted, especially in Singapore where much focus has been placed on mother-child relationships instead. I entered the workshop just for yet another learning experience, to gain a different viewpoint towards writing. I gained so much more because Tony is honest, and he encourages venturing out of one’s comfort zone. The workshop opened up my worldview. It was a safe space to discuss issues, to find that inner-self that I never could quite express. You might not find that the exercises directly relevant to playwriting, but it does help to dig out who you are and what your interest is. It added a different lens for me to see myself and my surrounding. The mentorship period was prolonged, but I have to thank Tony for always reading and giving very “to the point” feedback. He does not shy away from sharing cutting comments, and that is really appreciated. And now that it’s going to be publicly read, I think this is another step in the development, and I look forward to comments to help me push the writing further. Anything different or interesting about the workshop and working with Tony Perez? Tony has his way of digging out one’s innate ideas and intimate stories. The workshop is definitely not your conventional “introduction to playwriting”. Meditation sessions, chakra points, and even discussions about past lives and dark secrets, the workshop really opened me up and helped in my creative writing. The post-workshop mentorship also helped me to have a clearer sense in developing my writing, as mentioned earlier. “Writing from the Heart” really holds true to its name. Before the workshop, I kept holding on to writing techniques and plotting twists and turns. But now, I do want to put more heart in the writing, laying bare my thoughts and feelings in the dialogues. I used to write more abstract plays, perhaps because I always felt that I could not put in too many emotions, and afraid of reflecting reality in my writing. Now, my range has expanded. I am especially glad to pour my hearts out in words. Did you have any expectations or set goals when you first attended the workshop? If so, what are they and did you manage to reach those objectives? No. And I advise everyone to keep an open mind and come attend the workshop. Get in touch with your spirituality, follow your heart and be surprised. I am especially glad I had the chance to make great friends from the local theatre community. Take a swig and come join in the fun. There are many worlds that will open up through the process. Write on! If you’re keen on saving yourself a seat to hear the reading of Isaac Lim’s Go Home, be sure to register today on our Eventbrite page! Interested in Playwriting? The Writing from the Heart Workshops that Isaac speaks about will be happening from 29 May to 4 June, find out more about it here!